You already know that it galls me when people extol the “oppressed” Palestinians—whose government has refused generous Israeli offers of peace time after time—and decry the “war crimes” committed against them by Israel. They never mention, of course, the three big war crimes regularly committed by Palestinians, which are far more odious than the accusations of “occupation” which are arguably questionable. Palestinian war crimes. 1.) combatants don’t wear uniforms, something required by international law. 2.) Palestinians deliberately target Israeli civilians, also banned by international law. 3.) And Palestinian fighters hide behind civilians or fire rockets from within civilian areas, also prohibited by international law. But one of the most odious and reprehensible acts that the Palestinian government commits towards Israel is to pay terrorists for killing Israelis, often civilians. If the terrorist dies as a “martyr”, his or her family gets money—often a substantial sum. This is called “pay for slay,” and is highlighted in the video below. That video also shows the disgusting anti-Semitic depictions of Jews on Palestinian state media (something repeated throughout the Arab world), things that the Woke Left also ignores when going after Israel. There have been odious acts of murder by Israelis, too,like Baruch Goldstein‘s 1994 murder of 29 Palestinians, and the 2014 kidnapping and killing of a Palestinian boy by three Israelis. Goldstein was beaten to death on the spot. The Israelis were given long prison sentences, not rewarded, and that alone shows the moral difference between the Palestinian and Israeli governments. It takes a special kind of brainwashed hatred to make a mother experience joy when her son kills himself along with a bunch of Jewish civilians, or to make a small kid hate Jews so much. In the Palestinian Authority’s 2018 budget, funding levels for “pay-for-slay” programs and the Palestinian Authority’s social welfare programs are disclosed. Terror payment programs include salaries to prisoners set at nearly $150 million. Allocations to those killed or injured in “wars” with Israel is budgeted at over $180 million, together more than $330 million overall — consuming over 7 percent of the annual Palestinian budget. These payments go to approximately 10,500 imprisoned and released prisoners and some 37,500 families of martyrs and injured. In contrast, the entire 2018 budget for the Palestinian Athority’s social welfare system is about $214 million dollars, and supports 118,000 households: a much larger group subsisting on a much smaller budget. Enshrined in Palestinian law, imprisoned terrorist payments are almost entirely dependent on length of incarceration, and not on personal financial circumstances. Prisoners receive 1,400-12,000 shekels, paid monthly [$1 US = 3.6 shekels], regardless of any need-based qualifications. Families of those killed perpetuating terror attacks receive 6,000 shekels immediately, then a minimum of 1,400 shekels monthly, for life. True social welfare recipients, in contrast, are only eligible based on need, and they do not get automatic payments. Once approved, they receive benefits of only 250-600 shekels per month, paid quarterly. The maximum welfare payment is 57 percent less than the minimum pay-for-slay salary. 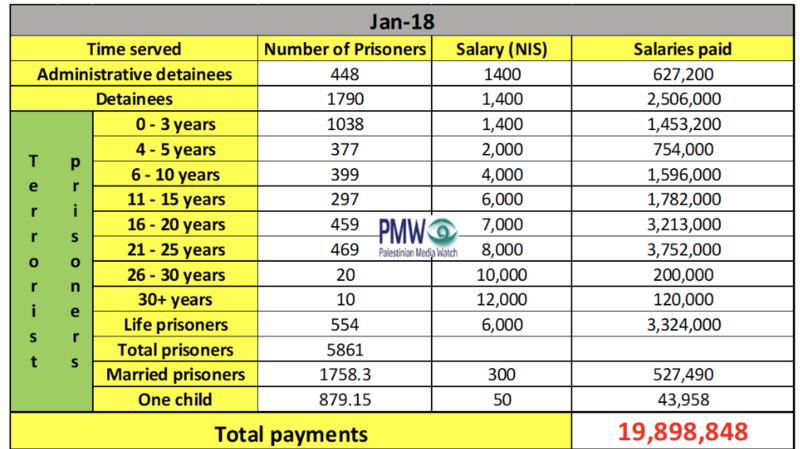 For example, based on the information provided by the IPS that appears in the 2 left hand columns in the chart below (“time served” and “number of prisoners”) and the PA’s own terrorist prisoner pay scale (“salary” column), PMW has calculated that in the month of January 2018 alone the PA paid almost 20 million shekels in salaries to the terrorist prisoners.
. . . Finally, it should be stressed, that these PMW calculations refer only to the PA payments to terrorist prisoners and released terrorist prisoners, and do not include the PA payments to the families of dead terrorists, the “Martyrs.” The PA budget for the terrorist “Martyrs” is listed under the same budget category as the wounded and those civilians who have been killed but were not involved in terror. The 2018 PA budget allocated 687 million shekels for all these. Under Israeli law, the amount the PA spent on the terrorist “Martyrs” and wounded involved in terror must also be deducted from the money Israel collects and transfers to the PA. At this point, PMW does not have a comprehensive report on the amounts paid by the PA to the families of the terrorist Martyrs or to the wounded terrorists. If you’re going to impugn these sources—and remember that Western liberal media doesn’t talk about this stuff—then show why the figures are wrong. But there’s simply no questioning, since the Palestinian government admita it, that terrorists or their families (in the case of “martyrs”) reap substantial benefits from attacking and killing Israelis. You can explain to me why that’s justified. It is infuriating to see the Left, much of the West, and the United Nations demonize Israel, with the UN passing resolution after resolution against it, while completely ignoring the transgressions of Palestine and Palestine’s clear violations of international law. It makes no sense unless you bring in the notion of anti-semitism. This entry was written by whyevolutionistrue and posted on February 4, 2019 at 1:15 pm and filed under terrorism. Bookmark the permalink. Follow any comments here with the RSS feed for this post. Both comments and trackbacks are currently closed. As always this is so terrifying to me. this fact needs to be broadcast. Representative Omar in the US Congress is a supporter of the PLO. She should be asked her position on this one. This is the US congresswoman who continues to make anti-semetic statements yet the congress won’t sanction her. What it is – State Sanctioned Terrorism. It is no better than ISIS or Taliban or any of the other named terrorist organizations. So if the Palestinian Authority or State is not on the list of known terrorist organizations, I do not know why. This is ground that I am very reluctant to venture onto, because my origins are Jewish, and I have absolutely no doubt about Israel’s right to exist, but it is also ground that I feel needs to be put into perspective. It is something like that experience of sitting in a train at a station, when the train next to you moves off, and you think that your own is moving. So, to be a citizen of Israel (unless you are ultraorthodox, a group that I know is deeply disliked at least in part because it evades some of the obligations involved in being an Israeli citizen), you must do military service, which essentially means policing Palestinian territories, which means risking your life, on the one hand, and perhaps doing serious damage to other lives,on the other hand, neither of which is an easy experience. Yes, if you are Israeli, and particularly an Israeli soldier, most Palestinians are brought up to hate you. Yes, if you are a Palestinian, many Israelis are brought up to fear you, and many settlers to hate you. These are not good conditions for the development of mutual esteem. So on the subject in question, it is of course absolutely correct that the State of Israel does not pay its soldiers a “bounty” to kill Palestinians. It pays them a salary for doing their duty, which may include killing Palestinians. Conversely, I have no reason to question the information provided here about the rewards (the “bounties”) paid to Palestinians for killing Israelis. I am uncomfortable about putting it this way, but it seems to me that the difference between the Palestinian method of rewarding killing, and the Israeli method of rewarding killing, is the difference between self-employment and salaried employment. Israeli citizens get a pension, Palestinians get a bonus. It’s more about accountancy than morality. I don’t buy this equivalence. The self vs salaried comparison only works if you think that the aim of both Palestinian and Israeli soldiers is to kill the other and/or civilians. That is explicitly the case with the Palestinian soldiers. But not Israeli soldiers, whose mission is to protect Israel, not kill Palestinians. The latter may happen in conflict, but I doubt there’s evidence of Israeli’s specifically targeting either civilians or soldiers that aren’t outright attacking Israel. So the moral difference is real and significant. On the contrary indeed, Israeli soldiers make efforts, sometimes great efforts, to avoid civilian casualties. I think that is part of their mission. At any rate, even though civilian casualties do occur, it generally is due to point 3 (hiding behind civilians) that Jerry mentioned. I sometimes get the impression there are some within the Palestinian authority that actually seek Palestinian civilian casualties for propaganda purposes. Terrorists kill civilians randomly in peacetime as a way of inspiring terror and coercing people and their governments to agree to something. Freedom-fighters may style themselves in this way, but it doesn’t mean they aren’t terrorists. If in fact Israeli military members are purposely or given license to kill Palestinians as their duty then you might have something here. However, far as I know this is just not true. If you simply equate military service on the same level with terrorism than you have another problem. I would rather compare it to salaries to police officers and compensations paid by drug gangs (see „Freaconomics”) to their killed member’s families (they do it in order to get the loyalty of the surrounding community, though they do not pay as much as Abbas does). On the one side you have Israelis (not only Jews, but Druzes, Beduins, Arabs – both Christian and more and more Muslims) who are defending their homeland and their families from people determined to kill them, on the other you have people whose goal is to annihilate the Jewish state. They could have had their own state many times over: 1937, 1947, 2000, 2008 and any time in between had they sincerely came with an offer of compromise. They never did and they rejected any offer from the Israeli side. Israelis are not killing Palestinians randomly – only those who are attacking them. It shouldn’t be so difficult to see the difference. You can read the founding charter of Hamas online. Some Palestinian leaders have tried to distance themselves from it, but its fundamental principles have never been abandoned. My takeaway from it is that, if Hamas could, they would kill every Jew in Israel. And they don’t seem to care if a lot of Druze, Christians, and Muslims get killed along the way. As Sam Harris argues, we need to compare Hamas’s intentions to those of Israel. What would Israel do if they could do whatever they want? We know the answer, because they have the power right now to do it. The IDF could kill every last man, woman, and child in the Palestinian territories in a matter of days if they wanted to. Obviously, they don’t want to. In, fact the IDF’s policy (notwithstanding the occasional rogue act by an IDF soldier) is to avoid civilian casualties whenever possible. This is a crucial moral difference between Hamas and Israel. Gandhi was an activist. He led peaceful protests against the British. He was not a terrorist. He did not recommend violence. That’s what he is famous for. Back to our darkest days of the future present, whatever the hell i mean by that, something to do with no where special just more of the same, anti humanist, shackled to our grim past. I agree, until the west and the media start to publish how the Israeli, Palestinian conflict is really played out, cutting through the disinformation, blind apologetics, antisemitism from the west, we will never have pressure bearing down on this atrocious pay to kill, let alone pressure on the Palestinians to change. Until then, they get a pass from the west to continue behaving like unhinged, woeful world citizens we could do without. That’s not a call for genocide, just change. It’s not just a pass they get from the West but a lot of the money that goes in these salaries to terrorists or rewards to their families. Edwin Black has a lot to say about this in his “Financing the Flames”–specifically US and European tax money being channelled into the Palestinian Ministry of Prisoners Affairs, which dispenses the salaries. There’s no reason to stop terrorism if foreigners can be conned into paying for it! Totally different. Where are the IDF members planting random bombs or are suicide martyrs? Where are the IDF members deliberately setting out to murder Palestinian civilians especially children. May as well describe USN Seals or the SAS as paid assasins. The comparison does not work imo. The PA is not the first fascist-style regime to obscure the horrendous oppression of their own subjects and maintain a stranglehold on every form of political corruption imaginable by attacking Jews. But I guess they’re probably the most successful. I find it baffling that they have been so effective at conning the otherwise liberal media into supporting this institutionalised ritual criminality. I’m starting to see some pathology, or at least some serious obliviousness, from the vocally pro-Palestinian side. I obviously don’t mean everyone in that camp. But it seems like a large portion of them are willing to overlook too much, and deny too much history, in order arrive at their views. This is horrifying. To enshrine “Thou shalt kill” in both religious and state law, to incentive killing including promising instant gratification (heaven + virgins) for murder/suicide perpetrators, — I can think of no better illustration of how badly religion can go wrong. The hatred for Palestinians on the part of many Israelis is also horrific, although not enshrined in law. I think of the Palestinian teenager who was caught and burned to death. I also think of the Israeli and Palestinian friends who were hugging and weeping over that event. The situation really seems hopeless. Or if there is any hope, I wonder if it can only exist when previous generations pass and younger people get tired of all the hate. I just don’t know. Couldn’t both sides just live in peace while praying for Allah / Jehovah to sort it out? Makes one think of this British politician (forgot who it was) asking why Jewish settlers and Palestjnians could not settle their differences as good Christians? Never fails to get me to roll my eyes. There was a movie series titled “Killing for a Living”. It was about predation, but would fit some Palestinians. Naive question, but what about Israel’s colonies ? Have they done so ? Are they allowed them ? What fuels that hatred, beyond just “existing” (if there’s anything else) ? Has Israel *never* done anything wrong ? The area of Israel is some 20,000 square kilometers. The area of Arab states is over 12,000,000 square kilometers. Arab states have some 50 times the population of Israel. Are you seriously asking whether Israel is like former British Empire (or Ottoman Empire, to be closer the the historical reality). Hatred is fueled by religion (there are many verses in Koran mandating hatred to Jews), by the very popular Nazi ideology which had a great influence on the Arab world from the late 1920., by the traditional Christian/European antisemitism transplanted on the fertile ground of Islam. Your question whether Israel has never done anything wrong sounds exceedingly strange. Of course, Israel committed many policy mistakes (like any country), its citizens commit crimes sometimes (like citizens of any country). What do you ecpect from Israel? An ideal not of this world? You assume way too much of me and overstretch the implications of my questions. I seriously ask what’s about those colonies I hear about sometimes (yes, my knowledge on the matter is non-existant). *Are* they colonies ? Are they legal or not ? I don’t assume Israel is a paradise ; but my above question could also lead to understanding why Palestinians are upset. I don’t care about any side acually, I don’t proclaim one side lies more than the other : I just want to get both side’s stories. In short: there are very solid legal arguments for the legality of Jews living on the West Bank, and there are legal arguments against it. All arguments against are based on the idea that there should be places in the Middle East where Jews are forbidden to live because Arabs do not want them there. BTW, many Israeli Arabs moved into West Bank or east Jerusalem but nobody calls them “settlers” and nobody protests against their living there. Protests are only against Israeli Jews. Dear Malgorzata, I completely disagree with your statement that Israel’s settlements in the West Bank might be legal. I guess this is not the place to mention all the relevant facts and arguments (for instance, that the settlements are outside the official borders of the State of Israel; the “Jewish National Home” mentioned in the Balfour Declaration and in the San Remo Resolution doesn’t refer to the independent Jewish state; in the West Bank Israel has created a situation where two different legal systems are applied to two populations that live in the same area; etc etc). I also fail to see how the fact that Israel conquered the West Bank from Jordan supports the legitimacy of the settlements. Of course, I agree with you that there are, unfortunately, “places in the Middle East where Jews are forbidden to live because Arabs do not want them there”, but, again, how is this relevant to the legality of the settlements? Many people disagree with you, legal scholars among them (I’m not one of them). The Balfour declaration gave national rights in the Jewish National Home to Jews with provision that civil rights of other peoples than Jews inhabiting this area will be preserved. (Well, they are.) The Mandate system was supposed to lead to creation of independent states, among others Arab Iraq, Syria and Jordan, mixed Christian/Muslim Lebanon and a Jewish State. There are many disputed territories in the world. Nowhere are people from one side settling in the disputed territories called “settlers” and their town and villages deemed “illegal”. Nowhere in the final peace agreement was there a demand for dismantling their homes and move masses of people from the territory. Only in Israel. Like you, I am not a legal scholar, and I realize that the legal status of the Green Line and of the West Bank is unclear to say the least. Yet, my argument is based, among other things, on the de facto situation that Israel itself doesn’t recognize the West Bank as its own territory (it hasn’t annexed it), and its civil law is selectively applied on some of the West Bank population (according to the criterion of ethnicity). I am Jewish, I live in Israel, and when I evaluate the situation I don’t go back to Balfour, San Remo, the Ottomans or the UN resolutions (which are, in any case,heavily biased against Israel), but on the simple de facto situation when my own country doesn’t recognize Jenin or Hebron as its territory. In this sense, when Israeli Jews settle in the area which is not recognized by Israel as Israel, I call it illegal. What about Israeli Arabs who live behing the Green Line? Do you call them illegal as well? If so, you are in a minority of one. No, Israel did not annex West bank just because it took into consideration the Arab population there. Therefore it cannot apply Israeli law to them. To do it would mean annexation. As far as I know no Jews are living in Jenin (and generally in autonomous Palestinian Areas A and B). Hebron is a special case with provisions for Jewish presence written into the Oslo Accords, signed and approved by PLO. 1. As Israel doesn’t claim it, to whom does the West Bank belong? 2. Do the settlers purchase the land and if so from whom or do they simply take possession? Thanks for asking. I understand what you and others are trying to say, but you can find all the relevant information online. My argument is limited to one specific issue that I hope I clearly presented. I would only say that if the UN, which created Israel, “most of the West” which is broadly fact-based and justice-based, the American real media, and Jimmy Carter, a mind-numbingly rational global observer, condemn many of the actions of Israel, then you might want to look at your own biases here. It’s unsettling to see a brilliant scientist ignore facts. Why don’t you look at YOUR own biases, since you seem to have no problem with what the Palestinians do. Did you read this post? If your first reaction was to say “well, other people condemned Israel so what Palestine did was okay,” then you are condoning terrorism and murder. Biased much? It’s laughable for you to say that “most of the west” and the UN are “broadly fact based”. The UN did NOT create Israel. Israel was created by The Mandate for Palestine, as administered by Great Britain, via the auspices and signatories of the League of Nations and the signatories of the San Remo conference. These signatories were 1) every Arab leader or their proxy and 2) Every country in the world. Five hours after Israel declared independence, it was illegally attacked in a war of aggression by five Arab nations, nations which had just rejected a proposed UN Israel partition plan. They illegally took territory from the new State of Israel. Judea and Samaria, Gaza, and the Golan Heights were these territories. It was not until Arab nations again attacked Israel in in 1968 (specifically to annihilate it and every Jew) that they lost these territories back to Israel. Judea and Samaria make up what Jordan called “The West Bank”. As far as I can tell, the UN has always maintained that territories taken in wars of aggression must be returned. Except they did not maintain this principle in one case – when Israel was attacked. This is the outrage that nobody wants to talk about. And it is outrageous not just because of its exceptionalism. It is also outrageous because Article 6 of the foundational charter of the UN itself is a pledge for the new UN to honor the obligation of The League of Nations with specific regard to the formation of Israel. Clearly, the UN has been an antisemitic anti-Zionist enterprise from its very inception. The writer does not understand the severity of the non legal settlement of Jews from the world in Palestine. The Palestinians are only fighting for their lives , their rights to live in their homeland in piece with no interference from so called evangelists and zionists and poorer Jews who are coming to an idea of Israel. The Palestinians shouldn’t accept a piece plan from Israel or settle for less than all of Palestine. The law of the world are not biblical or what an evangelist think the world should run like or what a Zionist thinks off. These people or oppressors. And don’t understand the consequences of what they have done and what they are doing. Palestine is for the Palestinians of all religions. Not the the so called state of Israel. And all Jews who immigrated to Palestine have no Wright to be in Palestine. No, I do understand; I just don’t agree with you. (It’s “peace plan”, by the way.) Read Roger Lambert’s history of the formation of Israel a few comments above. And “so called evangelists and zionists”? Seriously??? I guess you think that what the Palestinians do, which is what I talked about in the article, is okay with you. By all means cut the throats of babies and kill civilians in a country established by the UN. That’s okay! You are reprehensible. In response to an article about Palestinian bigotry and terrorism, about their violation of international law and killing of civilians, you say it’s okay because the Jews deserve it: they went to Israel (which you call Palestine), and for that they deserve to be killed. I don’t say this about many commenters, but you are a morally blind person who justifies the murder of innocents. David, I could not disagree more with you (note, I’m not Jewish, nor a Christian, let alone an Evangelist). Zionism was a movement to give Jews a state where they would not be persecuted. And we all know they were, alive the diaspora, and well before the Holocaust. What was more natural an area than the one they were chased from centuries earlier? Note also that some Jews never left the area, conquered by the Arabs, under the banner of Islam, and later the by the (equally Islamic) Turks, and later still by the British empire. Most Palestinian refugees left the territory in 1948, when the 5 Arab armies would ‘drive the Jews into the sea’. That did not happen, and now there was a refugee problem. Note that those that remained in Israeli territory are Israeli citizens now an have eg. full voting rights. Israel has tried several times to find a compromise, gave up on Sinai, Gaza, and West Bank, but they did not propose their own annihilation. Your call for a one State solution, especially under present circumstances, is nothing short of a call for genocide. That is not a proposal that is in even the remotest way reasonable.